Click and Make-Up Beauty Blog: What's In My Bag? Since I started this blog I've wanted to do a 'what's in my bag' post, but never got around to it. 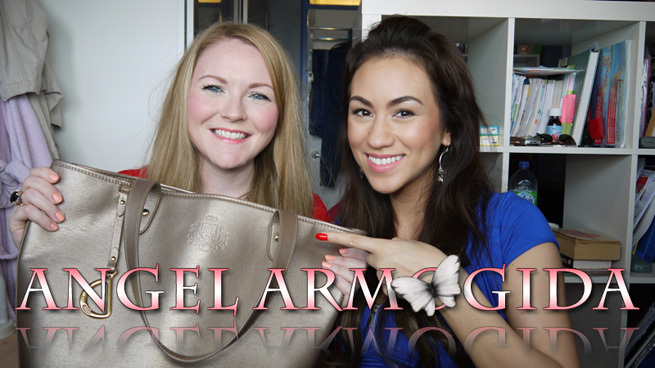 Making a video of this type of this is much more straightforward, so I hijacked Angel's YouTube channel to bring you the contents of my new bag! Some bits I picked up on my trip to New York last month, but I'll still be doing a few posts on the make up items I purchased. What's In My Bag vids are some of my favourites on YouTube as I love being nosey, so I hope you all enjoy! And I apologise profusely in advance for saying 'shizzles'... I'm blaming it on nerves, 'kay?! For more great make-up, beauty and fashion videos SUBSCRIBE to Angel's channel! This video is worth watching, peoples! Fo' shizzles! Ok ok enough with the shizzle now haha! I too always wanted to do one but if people saw what was inside my handbag they'd think i'm some kind of hoarding bag lady that probably pushes a shopping trolley round town full of "my pretties". My bag is full of junk!